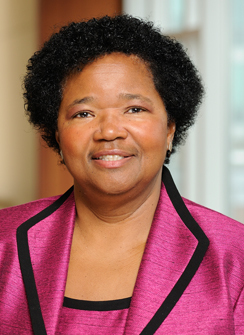 Phyllis Sharps, Ph.D., RN, FAAN, is the Elsie M. Lawler Endowed Chair, Associate Dean for Community Programs and Initiatives and Professor at the Johns Hopkins University School of Nursing. Dr. Sharps is the director for the Center for Community Innovations and Scholarships, which two community nurse lead managed centers for the School of Nursing (East Baltimore Community Nurse Centers), and the Health and Wellness Program at the Henderson Hopkins Partnership School. She has published numerous articles on improving the reproductive health, reducing violence among African American women. Her practice and research examines the consequences of intimate partner violence (IPV) against pregnant and parenting women, specifically, the effects of IPV on the physical and mental health of pregnant women, infants and very young children. She has been the principal investigator for $3.5 M 5 year research grant funded by NINR, Domestic Violence Enhanced Home Visitation – DOVE, which tested a public health nurse home visit intervention to reduce effects of IPV among pregnant women and their newborns. Currently she is the principal investigator for a second 5-year NIH/NCID $4.2 M grant “Perinatal Nurse Home Visitation Enhanced with mHealth”, which tests the use of computer tablets for screening and intervening for IPV in the home. Most recently, Dr. Sharps received a 2 year, $1.2M grant from the Health Services Resources Administration (HRSA), “Advanced Nurse Education Workforce (ANEW)”, which provides scholarships to primary care nurse practitioner students preparing to work in underserved areas with underserved populations. In 2009, Dr. Sharps gave testimony before the U.S. Congress, including then Speaker of the House Nancy Pelosi, on the need to reform health care to provide better access to evidence-based nursing practice for pregnant women and new mothers. Other important policy initiatives informed by contributions from her multidisciplinary research teams have resulted in appointments to the Institute of Medicine (now National Academy of Medicine) Board on Military and Veterans Health and the IOM Committees on the Qualifications of Professionals Providing Mental Health Counseling Services under TRICARE. Appointment to the veterans’ health committee was in recognition of her work as a nurse in the military, her women’s health expertise, and her study of abuse during pregnancy in military women. Dr. Sharps is a Fellow of the American Academy of Nursing, a 2013 inductee into the International Nurse Researcher Hall of Fame, Sigma Theta Tau International Nursing Honor Society and 2015 recipient of the Visionary Pioneer Award from the University Of Maryland School Of Nursing. She received her BSN from University of Maryland School of Nursing, MS (Maternal and Child Health) from University of Delaware School of Nursing and her doctorate from the University Of Maryland School Of Nursing. She also completed a fellowship in adolescent health at the University Of Maryland School Of Medicine.